See directions for important notes about this recipe. Double the Williams Sonoma Lemon Pound Cake Recipe and pour into a 9x13 pan. With the doubled recipe, I found the time to be a little off. I kept the baking temp the same but I only went about 50-60 minutes before it was ready to be pulled. So just watch it so you don't burn it. Since everyone's ovens are different. In the top pan of a double boiler, whisk the eggs, sugar and key lime juice. Continue to whisk over medium heat. When the mixture starts to thicken, add a slice of butter, one at a time until you've added it all. Don't stop whisking. Keep whisking until the butter has completely melted. The mixture should be pretty thick. Pour the softened gelatin to the lime mixture. Remove from heat. Using a fine mesh strainer, strain the mixture to ensure you don't have any clumps or egg pieces left. Stir the lime zest. Allow to cool in the refrigerator until ready to use. Beat the butter, key lime zest, vanilla and salt until creamy. Add the remaining ingredients one at a time and fully incorporate before moving on to the next one. When you get to the powdered sugar do just a little at a time and blend completely before adding more. Remove the cake carefully from the baking dish to a cooling rack. Using a knife, and starting at one end, slice the cake like a "bun" making two. Set the top piece aside. Spread the Key Lime Filling across the bottom. Place the top piece back on top gently. 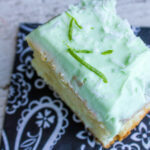 Frost the cake with the Key Lime Frosting. Sprinkle the top with shredded coconut and more key lime zest. Place the entire thing into the refrigerator for about an hour to chill.